The McCauley family has been traced back to my great-great-great grandfather Andrew McCauley (born in Ireland about 1801) who married Mary Neely (born in Ireland 1806) in 1825. John Snr. McCauley, my great-great grandfather, born in 1826 in Clogher, County Tyrone, in what is now Northern Ireland, was their eldest child. 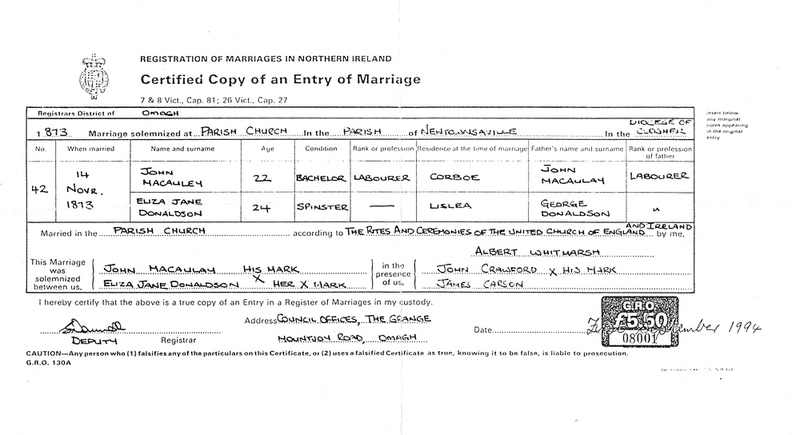 John Snr.’s brother, George McCauley, married Sarah Ne(i)ely, on 29 April 1867, at St. Macartan's Cathedral, Clogher, and they had two children, George Jnr. (born in 1860) and Annie (born on 19 October 1871). Sarah (now widowed) and George Jnr. were still living in Ireland at the time of the 1901 census, George Jnr. and his wife, Ellen, having had two children, Robert and William George. George Jnr. was the coachman for the Rector of Ballygawley and his two sons worked on Richmount farm. John Snr. married twice, his first wife being Elizabeth Irwin, whom he married in 1849. Elizabeth was born in 1833 in Clogher and died on 11 November 1872 in Ireland. John Snr. and Elizabeth had 14 children, all born in Northern Ireland, some of whom died in infancy; the second of their children was my great grandfather, John Jnr. McCauley, born in Clogher in 1852. John Snr. married his second wife, Mary Ann Williamson, born in Belfast in 1847, on 28 January 1874 in St. Macartan's Cathedral, Clogher. John Snr. and Mary Ann apparently had one child, Sarah May, born in Northern Ireland on 10 February 1875, the year after their marriage, but there are doubts about her parentage. 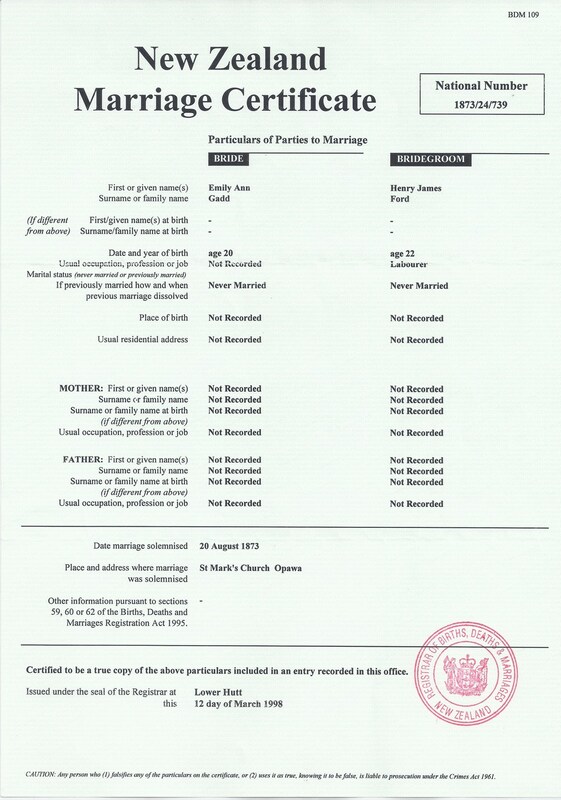 On her death certificate, Sarah May's mother's maiden name is given as More or Moore, not Williamson, and it is rumoured in her family that she may have been born in Ireland but went as an actress to the U.S.A. One possibility is that Sarah May was "adopted" by John Snr. and Mary Ann, although formal adoption did not exist in those days. John Jnr. McCauley's wife, my great grandmother, was Eliza Jane Donaldson, born in 1851 in the townland of Derra(y)bard, Tyrone, on the property of Samuel Vesey. The marriage of John Jnr. and Eliza Jane took place at Newtownsaville Church, Tyrone, on 14 November 1873 and at that time they were residing in the Corboe and Lislea townlands respectively. Eliza Jane was already the mother of her first daughter, Jane, born on 7 November 1870; the birth certificate records the father as John, aged 44, and it is interesting to speculate whether this could have been her future father-in-law, John Snr.! John Snr. and Mary Ann McCauley and their family, including John Jnr. and Eliza Jane McCauley and their first two children, sailed for New Zealand from Liverpool on 15 September 1876 on the ship Jessie Osborne. The passenger list below indicates that the total cost to the New Zealand government of the McCauley family's passage by assisted emigration was £134/16/1 1/2, of which £23/8/-, covered by promissory notes, was intended to be repaid by the McCauleys, perhaps in instalments, after their arrival in New Zealand. In the event, the names of John Snr. and John Jnr. McCauley appeared on a long list published by the government in 1892 of immigrants who had not repaid their promissory note debt that, for the McCauleys was now recorded as £29/8/-. The Jessie Osborne, a full-rigged iron vessel of 1058 tons, under the captaincy of Captain Falconer, arrived in Auckland on 19 December 1876. The voyage from England had not been without incident for the McCauley family. Isabella, the one year-old second child of John Jnr. and Eliza Jane, had died from Tabes mesenterica (tuberculosis of the lymph glands inside the abdomen, caused by drinking milk from cows infected with tuberculosis), and Martha, the unmarried daughter of John Snr., who was perhaps as young as thirteen, had given birth to a son George John (Peg-Leg) just over a week out from Auckland. The McCauleys, along with a number of other people from Northern Ireland, mainly Orangemen, had been persuaded to emigrate to New Zealand by a campaign of lectures, newspaper reports and circulars conducted by George Vesey Stewart, of Martray Manor, Ballygawley, County Tyrone, who had negotiated with the New Zealand government for a large area of land to be made available in Katikati, in the Bay of Plenty, North Island. The first party had sailed on the ship Carisbrooke Castle, which arrived in Auckland on 8 September 1875. The McCauleys, from the Stewart estates in Tyrone, were regarded as being part of the second party, most of whom, possibly including one of John Snr. 's other sons, James, sailed from Belfast on the ship Lady Jocelyn, which arrived in Auckland on 17 August 1878. “I believe the woman is not right in her head. She gave away one of her children to the natives before she came down here. She had not been living with me for a fortnight before she came. There were some outlandish parties in the bush, and I think they were too much for her. I knew she was down here, and I knew where she was for the fortnight before”. John Snr. agreed to take his wife back and the case was withdrawn. It seems that Mary Ann and John Snr. subsequently separated and Mary Ann died of tuberculosis on 17 June 1885 in Auckland. She was buried two days later in Symonds Street Cemetery. John Snr. McCauley, who was apparently regarded as a "hard" man, appears to have had a penchant for accusing his fellow settlers of theft. In 1888, John Hamilton was accused of stealing a one pound note, a half sovereign, a stick of tobacco and a box of matches from John Snr. 's house during the night. After various court appearances, at which Eliza Jane, William and Sarah McCauley gave evidence, John Hamilton was found not guilty. In 1889, Henry Foley was accused of stealing a heifer cow from John Snr. and he too was acquitted. John Snr. McCauley died at his daughter Eliza's house in Te Puke on 13 June 1900 having suffered a paralytic stroke two years previously. He was buried in the Old Te Puke cemetery, his grave remaining unmarked until 2012 when McCauley family members paid for a headstone to be placed over it. Two of John Snr.’s sons, William and George, also found themselves in trouble with the law. In the New Zealand Herald of 3 April 1897, there is a report that “George and William McCauley were charged with stealing 48 tea-pots worth about £7”. In the edition of 19 June 1897, there is a further report that "George McCauley, who pleaded guilty to having stolen 48 tea-pots, was brought up for sentence. His Honour said he would treat accused as a first offender (the only other charge against him being one of drunkenness) and admit him for probation". William was sentenced to two years in jail for a second stealing offence and died in Katikati in an accident involving a horse in 1908. He is buried in the same grave in Katikati as his brother and sister-in-law, John Jnr. and Eliza Jane McCauley, together with Sydney John McCauley, the infant grandson of John Jnr. and Eliza Jane. Various books have been written about the Katikati settlement, including three that I possess, entitled: "My Simple Life in New Zealand" by Adela Stewart, James Vesey’s sister-in-law; "An Ulster Plantation" by Arthur J. Gray; and "Tales of old Katikati" by Elsie G. Lockington. John Jnr., a farmer, and Eliza Jane McCauley eventually had ten children, of whom the sixth was my grandfather, George Thomas McCauley who was born in Katikati on 19 September 1884; John Jnr. and Eliza Jane lived in Katikati until their deaths on 28 May 1910 (the same month that King Edward the Seventh died) and 25 March 1915 respectively. Apart from his farming activities, John Jnr. was involved in other work in the Bay of Plenty area. For example, in 1888, his tender to provide firewood to the Waihi Gold Mining Company at 3s 4p a ton was accepted and he and a colleague also won a tender to maintain a section of the Tauranga to Rotorua road at a price of £17 10s. However, ten years later, in 1898, his tenders for Te Aroha track repairs and for metalling a section of the Athenree to Waihi road were not accepted. Life for John Jnr. and his family did not always proceed smoothly in other respects. Catastrophic house fires occurred frequently in the Katikati settlement, generally caused by candles or by chimneys catching alight, and the Bay of Plenty Times reported that houses occupied by John Snr. and/or John Jnr. were destroyed by fire in 1879, 1881 and 1895. In the fire of 1879, a young girl of 8 (possibly Jane McCauley, John Jnr's daughter) heroically led her brothers and sisters and a large sow to safety. The cause of the 1895 fire was suspected to be arson although this was never proven. In this fire, the title deeds to John Jnr. 's land and a document pertaining to a life insurance policy were destroyed and replacements had to be sought. “It appears to us to be scandalous that some provision was not made to protect the public, by erecting railings in the most dangerous places. If such had been done, we are of the opinion that the accident would never have happened. Too much stress could not be laid upon the negligence of the Tauranga County Council, seeing how long a time had elapsed since the flood last March which caused the damage”.
" having gone into an auctioneers in New Plymouth, merely to brouse around, spied Eliza Jane McCauley encased in one of those large oaken frames (I can imagine that severe Irish face emphasised by the severely dragged back hair, the hard cold eyes, would positively glower down upon him). Gordon saw the portrait that he knew so well, for hasn't it glowered down on me from above and on several other McCauleys too. Very indignantly he swept up to the auctioneer and said "that's my grandmother hanging there-- I want to buy it" and he did". The present whereabouts of this photograph is unknown. Eliza Jane McCauley was reputably a strong and rather formidable woman who, following the birth of one of her younger children, apparently did the washing on the same day as the birth, milked the cow and then prepared dinner for her husband before his return from work to see his new offspring. As a member of the congregation of St. Peter's Anglican church in Katikati, she was one of the thirty-four local inhabitants who contributed (in her case 2s 6p) to the Memorial Window placed at the east end of the church in 1902 in memory of General T. H. Stoddart. Eliza Jane brought with her from Ireland a hand-made gold chain that was subsequently divided into three sections that were given to three of her daughters. In accordance with Eliza Jane's wishes, these have since been passed on to the eldest daughters of their families. Eliza Jane died of heart failure five years after her husband, John Jnr., apparently having never fully recovered from the shock of his tragic death. Two interesting articles from the Bay of Plenty Times, covering a family marriage and the death of John Jnr. McCauley, are reproduced in Appendices 1 and 2 at the end of this document. George Thomas McCauley married my grandmother, Sarah Ann (Pat) Ford, in Kaponga, Taranaki, on 4 August 1908; she was born in 1878 in Opawa, Christchurch, in the South Island of New Zealand. Sarah Ann was the third of the eight children of Henry James Ford, born in St. Giles, London, England, on 1 October 1851, and Emily Ann Ford (nee Gadd), born in East Street, Bedminster, Bristol, England on 13 August 1853 and christened on 11 September 1853 in St. Paul's, Bedminster. Henry James Ford and Emily Ann Gadd, my great grandparents, were married in St. Mark's Church, Opawa, Christchurch, New Zealand on 20 August, 1873. Emily Ann Gadd’s parents, Elijah Gadd (christened in Dundry, near Bristol, on 8 August 1830), a stonemason, and Sarah Ann Gadd (nee Cox—born 1830) were married in Bedminster, Bristol, in 1852. Gadd is an old name of medieval English origin, possibly derived from the occupation of driving cattle, or as a nickname for a persistent and irritating person, or from the old Norse/ Scandinavian personal name of Gaddr or Sting. The earliest Gadd names were recorded in Somerset in the 1300s. Gad(d) is also a name of Jewish origin, Gad being a son of Jacob and his wife's maid, Zilpah, and the founder of one of the twelve tribes of Israel. The Gadd family had lived in Dundry and the surrounding area of Somerset for many years. Elijah's parents were Jonathan Gadd, also a stonemason, and his wife Hester Gadd (nee Sage) who both died in Dundry and were buried in St. Michael's churchyard on 7 March 1875 and 27 March 1864 respectively. Sarah Ann Cox was born and brought up in the village of Stanton Drew, several miles from Dundry; she was christened on 17 April 1831 in Stanton Drew. Her parents were William Cox, a master cordwainer (or shoemaker) and Rachel Cox (nee Heal); the word cordwainer is derived from cordwain, the leather produced in Cordoba, Spain. A cordwainer makes high quality shoes and boots, whereas a cobbler repairs them. William and Rachel Cox died at the ages of 91 and 89 on 26 April 1889 and 21 February 1889 respectively. Their gravestone is still standing with a clearly legible inscription in the churchyard of St. Mary the Virgin, Stanton Drew; buried with them is one of their daughters, Anna Maria Cox, who died on 7 October 1913 at the age of 77. Beside it is another well preserved gravestone for a son of William and Rachel, Edwin W. Cox, and his wife, Mary Burch Cox, who died on 29 March 1920 and 10 June 1900 respectively. Edwin W. Cox also worked in Stanton Drew and is recorded in Kelly's directory as a cordwainer in the years from 1875 to 1902 and as a market gardener in 1906 and 1910. The 1913 memorial card for Anna Maria Cox shown opposite was sent to and retained by the Ford family in New Zealand, indicating that the descendants of Sarah Ann Gadd (nee Cox) kept in touch with her family back in Somerset for a long time after Sarah Ann's death in 1854. Elijah and Sarah Ann Gadd left the UK with their young daughter, Emily Ann, in 1854. The Gadd family sailed for Australia on the ship General Hewitt that departed from Southampton on 25 August 1854 and arrived in Moreton Bay (near Brisbane) on 16 December 1854. On arrival, the ship was held at the bar of the Brisbane River for a week because of bad weather. Sadly, Sarah Ann died towards the end of the voyage, on 2 December 1854, following the birth of her second child, Samuel, who also died the following month, in Brisbane, on 26 January 1855 at the age of 9 weeks. Samuel Gadd is recorded as the first entry for 1855 (probably the first ever entry) in the burial register for St. John's Cathedral in Brisbane (although incorrectly given his father's name of Elijah Gadd). Elijah and his second wife had at least 5 children, one of whom, Sarah Jane, died in infancy in Melbourne on 23 May 1862 at the age of 14 months of phosphorus poisoning after sucking the heads of lucifer matches given to her by another young child. The family was living in University St. at the time of Sarah Jane's death and Elijah was presumably still working on the Melbourne University buildings. Soon afterwards, he moved with his family (including Emily Ann from his first marriage) to New Zealand, leaving Melbourne for Port Chalmers on 21 June 1862 in the ship SS Gothenburg. It seems that Elijah and Sarah Ann subsequently returned to Melbourne for a time. It is not known when and how they travelled from New Zealand to Melbourne but Elijah (aged 37) is recorded as a passenger on the Otago that left Melbourne for Hokitika on 7 November 1867 and his wife (aged 26) as a passenger on the Alhambra that left Melbourne on 4 January 1868 for Hokitika. Presumably, they were visiting friends or relatives in Melbourne. It is not known how they travelled back to Christchurch after arriving in Hokitika on the west coast of New Zealand’s South Island. "The friends of Mr. Elijah Gadd respectfully are informed that the Funeral of his late wife will leave his residence, Hillsborough, at half-past one to-morrow (Saturday), Jan 14. Rees W. Walters, Undertaker". Elijah’s two wives and two young children, Samuel and Sarah Jane, are all commemorated or buried in the same plot at Barbadoes Street cemetery in Christchurch, New Zealand where the headstone is still to be seen. Later on, two of Elijah Gadd's sisters, Sarah and Hester, themselves emigrated from the UK to New Zealand with their husbands and families, arriving respectively in the ships Waikato on 3 October 1875 and the Dunedin on 3 July 1874. The grandchildren of Elijah's older brother, Samuel Gadd, also left the UK for Nova Scotia, Canada, with their widowed mother, Mary Ann Gadd (nee Thomas) in 1913; sadly, two grandsons, William Samuel and Arthur E. Gadd, were among the 65 miners who lost their lives in the disastrous New Waterford mine explosion on 25 July 1917. "Sir, Allow me through your columns to ask upon what principle the tenders for public works are decided. Is it to defraud the public of their time and money that tenders are advertised; or is it to squander the money of the citizens to the benefit of some chosen individual? I ask the question because my tender for the 80 grey stones required by the Council for street marks, at 2s 4d per yard, was rejected, whilst the tender of another man at 3s was accepted. Why was my tender refused? For the last five years I have quarried more stone and done more mason's work than all the men in Canterbury. I am personally known to Mr. Holmes, the Railway contractor, and Mr. Brown, contractor for the Union Bank, who can testify the truth of my statement. Your obedient servant, Elijah Gadd, Quarryman and Stone Mason". "Sir, Permit me through your columns to make a few remarks upon the statement of the Town Clerk as reported in the "Press" of the 4th instant. He said that my tender was only 5s less than the one accepted. Now, sir, my tender for the 80 stones, 8in. by 8in. by 18in., amounted to £11 15s, whilst that of my opponent, which was accepted at 3s per lineal foot, amounted to £18. The chairman remarked that where the lowest tender was not accepted, the public knew there was a good reason for not doing so. I think, sir, if fair play and no favour is the order of the day in the City Council, the "good reason" referred to will be stated in justice to myself and the public. I am, sir, your obedient servant, Elijah Gadd"
It is interesting to note Elijah's assertion in the first of these two letters, written in 1863, that he had been quarrying stone and working as a stonemason in Canterbury "for the last five years". This suggests he had arrived in New Zealand in about 1858 whereas the records from Australia indicate he was in that country until 1862 (see above). Perhaps he made a number of return trips between the two countries during those five years, although searches have revealed no evidence of this. "Elijah Gadd was running close to the law in the seemingly perpetual game of "catch" with the constabulary and licensing committee. On 4th January 1877 the Star advised that: Elijah Gadd, licensee of the Heathcote Valley Hotel, was charged with having kept his house open and sold liquors to other than bona fide travellers, on the evening of Christmas Day. Constable Connell said he went to the hotel on the occasion referred to, found a light in the bar, and several residents of the Valley in the house. Two of the men who were in the house were called, and admitted being in the house, but denied having any drink there. Accused said no drink was supplied to other than travellers on the day in question, and, though he kept the door of the house open, he did not know it was contrary to the law. The case was dismissed with a caution". "He took every opportunity to promote himself, as this excerpt from a public meeting, held on 10th March 1879 attests. The meeting had been called to support the erection of a cart-bridge over the Heathcote River, near the Christchurch Quay. After strenuous debate among the well-attended meeting, Mr Gadd essayed to speak in opposition to the course now proposed, and, on obtaining a hearing, he strongly urged that the Cemetery road site, ever supposing a swing bridge had to be built, would pay handsomely. (A voice: "You want it near your public house, don't you Gadd?"). Elijah did not get his licence as the authorities thought quarrymen might get drunk and fall off the cliff faces, so the place served as a home until the early 1950s, when it was demolished. The Star of 15 June 1880 noted "License Refused. E. Gadd, Hill's road, Hillsborough"
Again showing his versatility and entrepreneurial spirit, Elijah Gadd became a market gardener, winning various prizes for his produce. He is mentioned in Gordon Ogilvie’s 1976 book, "The Port Hills of Christchurch", which also includes relevant photographs. Excerpts on Elijah Gadd from this book and from G. R. Macdonald’s "Dictionary of Canterbury Biographies" are reproduced in Appendices 3 and 4 at the end of this document. From these and the other references to Elijah, it may be surmised that, although a devoted family man, he was also a determined, single-minded and somewhat abrasive character, not universally popular with his fellow settlers or the Christchurch establishment. Perhaps he lived up to one possible derivation of his Gadd surname, namely "an irritating and persistent person" (see above) ! Elijah Gadd and the four youngest children from his second marriage (Alfred, Sarah, Eliza and Elijah) returned to Australia on the 1797 ton steamer Wakatipu that sailed from Wellington to Sydney, arriving on 31 May 1882. My great grandfather, Henry James Ford, accompanied them, apparently leaving his wife, Emily Ann, and his first five children behind in Christchurch. Elijah's eldest son, Frederick Reuben, was already in Sydney, having married there on 29 April 1882, but he died soon afterwards on 26 July 1882. Notices of the funeral arrangements, including invitations to friends to attend, were posted in the Sydney Morning Herald by both Elijah and Henry. It is not known when Henry returned to New Zealand but it must have been in 1882 or 1883 as he sailed back to Sydney on the Hauroto, arriving on 2 August 1883, before returning yet again to New Zealand before 1888 when his next child was born in Christchurch. It appears that Henry James Ford's eldest son, also Henry James, may have sailed from Wellington to Sydney on the Rotomahana when he was only about 12, arriving on 28 February 1887, before returning to New Zealand on the Tekapo, arriving in Wellington on 7 November 1889 and then disembarking in Lyttleton. The exact purpose of all these trips is unknown. It is of interest to note that the Rotomahana was the first sea-going passenger vessel built of mild steel and, in her day, was the fastest ship in Australasian waters, being dubbed the "Greyhound of the Pacific"
Elijah also returned again to New Zealand before sailing back to Sydney with his son on the Tarawera, arriving on 1 August 1883, a day before Henry James Ford's arrival. Elijah and his son returned to Wellington on the Hauroto, arriving on 3 August 1886. Elijah returned to Sydney for the last time with his youngest son, Elijah James, again on the Hauroto, arriving from Wellington on 27 September 1887. Elijah Gadd died of cancer at Newtown on 26 October 1888 and is buried at Rookwood in Sydney. Most of the descendants of Elijah and his second wife, Sarah Ann Hawgood, have continued to live in Australia. At the time of the 1861 census, Henry James Ford (aged 9), my great grandfather, was living at 14 James Street, adjacent to Covent Garden, London, with his father, James Ford, a General Dealer, his mother Ann and three brothers, Christopher (aged 14), Alexander (aged 6) and Archer (aged 1). Henry James Ford sailed alone to New Zealand at the age of sixteen, according to his daughter Sarah Ann in a ship named London but according to the shipping records as a paid, steerage passenger in the Light Brigade that left London on 19 May 1868 and arrived in Lyttleton on 26 August 1868. Henry subsequently lost touch with his family, although it is understood that he may have had as many as eight brothers and a sister, and that several of his brothers may have emigrated to America. It is of interest to note that his daughter, Sarah Ann (Pat), genuinely believed her father was the uncle of Henry Ford, founder of the Ford Motor Company, apparently because of their uncanny facial likeness, and was in the process of composing a letter to Henry just before her death (see transcription in Appendix 5). From the information I have obtained on the background of Henry Ford, the car man, it is clear that this supposition was incorrect. After their marriage, Henry James and Emily Ann Ford ( nee Gadd) continued to live in the Hillsborough/ Opawa area of Christchurch and, in 1892/3, Henry is recorded in the local business directory as a storekeeper in Hill’s Road, Opawa. In 1895, the Fords and their family of seven surviving children moved to Eltham in the North Island of New Zealand where Henry acquired land by the ballot system and set up a farm and saw-milling business. Having built a wooden cottage (or whare) to house his family, and cleared the land of bush, Henry noted that the clay in the hillside behind the whare was similar to that in Opawa and very suitable for brickmaking. He therefore began construction on a pug mill and other buildings and set up a brickmaking business that quickly thrived, there being no local competition at that time. Also the bricks were of good quality and intentionally made smaller than other bricks brought in from elsewhere so that customers had to return to Henry when their supplies ran out. Both Henry James and his son of the same name are recorded as brickmakers in the 1907 local business directory. Sadly, Emily Ann then took ill and died on 2 November 1907 in a New Plymouth private hospital. With the death of his wife, and his family grown up and moving away, Henry James decided in 1908 to sell the farm and brickworks and retire to Te Kuiti where he died on 2 April 1915. Both he and Emily Ann are buried in the Eltham cemetery. Roma Rebecca Jenkins has written up the story of Henry James Ford and his brickmaking business in her booklet "Bricks! Bricks! Forever Bricks" and I am most grateful to her for most of the above information. Henry James Ford's daughter, my grandmother Sarah Ann Ford, and her sister, Eva Emily, opened the "Oriental Tea Rooms" in Eltham in 1904 and, two years later, took over a two storey building "Westford House" that they converted to a Boarding House and Dining Rooms. Reportedly staunch members of the Women's Christian Temperance Movement, they offered an alternative to the pub and provided meals and lodgings for the many men who worked in the area, one of whom was Sarah's husband-to-be, George Thomas McCauley. My grandmother, who was apparently an accomplished seamstress and musician, playing the harp and mouth-organ, was long dead when I was born. I did, however, meet her two sisters, Elizabeth Ann and Eva Emily, on occasions during their latter years. My wife Liz and I also met up with her youngest brother, Frederick Thomas Ford, and his wife Tottie as recently as 1975 when we visited New Zealand soon after the birth of our elder son. Frederick Thomas, a farmer, had enlisted for the first world war on 11 October 1915, embarking from New Zealand on 7 April 1916 for the western front in France where he served as a rifleman in the 4th Battalion, New Zealand Rifle Brigade. He was one of 6-8 soldiers injured on 12 September 1916 when a bag of bombs being carried nearby was accidentally dropped and a bomb exploded. Frederick Thomas was subsequently admitted to Queen's Civil Hospital in Birmingham on 22 September 1916 with serious wounds to his thigh, foot and "lower extremities". 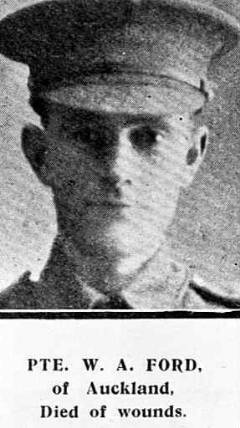 He was reported as being injured in the Auckland Weekly News of 16 November 1916. After several months in various hospitals, including spells in the Codford Hospital where he was treated on separate occasions for venereal disease and mumps, Frederick Thomas was eventually discharged but assessed by a medical board in early April 1917 to be unfit for further service. 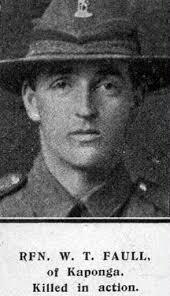 He later returned to New Zealand and was finally discharged from the army on 7 October 1917. Frederick Thomas Ford married Tottie Mudgway in 1919 and they had one daughter, Merlie Iris Ford, a music teacher. When Merlie Iris died after a short illness on 1 August 1970, her parents made a substantial cash gift to enable a Childrens Family Home in her name to be established in Ford Avenue, Whangarei. Another of Sarah Ann’s brothers, William Alexander Ford, an electrician, also fought in the first world war. After enlisting on 17 April 1915, he sailed for Egypt on 14 August 1915 and then on to the port of Mudros on the Greek island of Lemnos where he was based for the last three months of 1915. Mudros was the port from where soldiers left to fight in the Gallipoli campaign. After time back in Egypt, William Alexander embarked for France on 6 April 1916 on the Franconia and served there until 25 September 1916 when, during the battle of the Somme near Mametz, he suffered wounds to his shoulder and thigh and, after admission to a field ambulance, died the same day, aged about 28. He was a private in the First Battalion, Auckland Regiment, and is buried at Dantzig Alley British Cemetery, plot 7, row F, grave 5. A wooden memorial cross for William Alexander, previously sited in St. Mark's Church, Kaponga (a church that has now been closed and moved near New Plymouth for use as a wedding venue), is due to be re-located for display in St. John's Community Church, Kaponga. This cross has a metal strip with his service details and was probably returned from the Somme battlefield where it is likely to have been used to mark the position of his temporary grave. Sarah Ann's other brothers were Henry James and Christopher Reuben Ford, both of whom were farmers. William Thomas Faull, a cheese-maker, enlisted on 28 May 1915, being accepted on condition that he allowed "his teeth to be fixed". He embarked from New Zealand for Egypt on 9 October 1915 and later left for France. As a rifleman in the Third Battalion, Otago Regiment, he suffered a gunshot wound to his right shoulder during the battle of the Somme on 15 September 1916, the first day that the New Zealand Division was involved in a Western Front attack after its "blooding" at Gallipoli. It was also the first day that tanks were deployed in the war. William Thomas Faull was later admitted to Brockenhurst hospital in Hampshire, England, from where he was discharged on 17 October 1916. After further convalescence, he returned to France on 15 May 1917 and died on 17 October 1917, aged 24, in the Passchendaele battle near Ypres; he has no known grave but is commemorated on panel 3, N.Z. Apse, at the Tyne Cot memorial to the missing. Grave of Henry James Faull, A.I.F. burial ground, Flers, grave !.E.5. War Memorial Kaponga- Faull W.T. and Faull H.J. The second husband of Elizabeth Ann Faull (nee Ford) was Edward Burr Foreman, a hairdresser, whom she married in 1902, and with whom she had five children. Elizabeth Ann Foreman ran the "Coffee Palace" in Kaponga but, following Edward Burr Foreman's death in 1918, she and her family moved in 1920 or 1921 from Kaponga to Dannevirke where she ran the "Arcadia Tea Rooms". Elizabeth Ann is remembered as a gentle and kindly lady who never spoke ill of anyone and who had experienced more than her fair share of tragedy in her life. She lived to a great age of 91, dying in 1965. Eva Emily Ford (1880 - 1963), the other daughter of Henry James and Emily Ann Ford, married Henry Alfred Wood (1873- 1956) on 5 July 1906, with my grandmother as bridesmaid. Henry Alfred Wood was a farmer who involved himself in a number of local companies and community organisations. At the age of 80 he was persuaded to write a book entitled "The Life of a Pioneer Farmer". This book is on loan to The Eltham Historical Society. The only son of Eva Emily and Henry Alfred Wood, and their youngest child, was Henry William Carmichael (Harry) Wood, born in Eltham on 19 August 1917. After joining the RAF in England, he then became an Able Seaman in the Merchant Navy during WW2 and was a crew member of the 5759 ton British cargo steamer Empire Ocelot that was torpedoed and sunk without warning by the German U boat U-32 on 28 September 1940 in the Atlantic ocean. Two seamen were killed but the remaining 33 crew members, including Harry, were saved by the destroyer HMS Havelock after 5 hours in life-boats. Safely back in England, Harry gave a detailed account of this incident in a letter to his parents back in New Zealand, describing the aftermath of the attack, with the U-boat surfacing and circling the life-boats with only its periscope showing and the foredeck and bridge of the Empire Ocelot "standing perpendicular to the water" before the ship "slipped quietly under". While on shore leave in England at some stage, Harry visited the former Mabel Cox, the niece of Sarah Ann Cox, in Bristol and a photo taken of him during this visit was one of the last Henry Alfred Wood had of his son. Sadly, Harry was subsequently lost at sea on 17 August 1943 while a crew-member aboard MV Empire Stanley, a British cargo vessel of 6942 tons. It was en route from Durban to Aden and Beirut, carrying a cargo of 8890 tons of coal, when it was torpedoed by German submarine U-197 and sunk south of Madagascar; 25 persons were lost from a total crew of 54. Harry Wood is listed on Panel 45 of the Tower Hill Memorial, London, that commemorates men and women of the Merchant Navy and Fishing Fleets who died in both world wars and who have no known grave. It stands on the south side of Trinity Square, London, close to The Tower of London. Harry is also commemorated on the headstone for his parents' grave in Eltham Cemetery, New Zealand. My mother, Hazel Emily McCauley, was born at Meridith House (a boarding house) in Taumarunui on 28 September 1910 and christened on 5 February 1911 in St. Mark's Church, Kaponga. She was the eldest of the four children of George Thomas and Sarah Ann (Pat) McCauley who had moved to the Otunui district of the King Country, west of Taumarunui, in 1908. Sarah Ann had been successful in a land ballot held in New Plymouth on 12 June 1908, being allocated 530 acres of farmland in Otunui for a lease of 66 years "with a right of renewal for a further term at a government present day valuation" and with an annual rent of £29 4s. (5% of the capital value). To be successful, applicants had "to produce documentary evidence of their ability to work and finance their land and pay so much deposit as a guarantee of good faith". Sarah Ann farmed sheep on her property and, during their time there, my mother and her brother, John Glen, often used to visit a local woolshed while sheep were being dipped. John, at the age of five, was encouraged by the workers to smoke a pipe and in later life, when people asked whether he smoked, he always said "No, I gave it up when I was 9"!! The bush in the area was often cleared by fire and my mother remembered when a bush fire in 1915 raged out of control and nearly reached their house. Luckily, the rain came just in time. On occasions, the family would tramp through the bush to the Otunui Boat Landing to board the boat for the two-day trip to Wanganui, staying overnight en route at Pipiriki House. My mother recalled once wandering off with her brother John Glen after arriving in Wanganui and being lost for the whole day. In 1914, George Thomas McCauley set up a sawmill on the boundary of Sarah Ann's farm, cutting mainly rimu wood. Local roads were no more than tracks over which George Thomas hauled wood on a large wagon pulled by a huge white horse called Brian, often while George slept on the wagon. In 1919, he moved to a sawmill in Carter's Road, closer to Taumarunui, and Sarah Ann sold her farm and moved with the family to a house and "farmlet" 2 1/2 miles from the town. My mother, Hazel Emily, had attended Otunui School from 1915 to 1916, and again in 1919, before transferring to Taumarunui school. In 1917 and 1918 she lived in New Plymouth, "borrowed" (as she described it) by her aunt, Margaret Isabella Ladner (formerly McCauley) who was "an enthusiast about lessons" and encouraged her to do well at school. My mother often recalled the daily journey she was required to make to school in Taumarunui, aged 9 and 10, accompanied by her brother, John Glen McCauley. They first rode alone on a frisky Shetland pony called Bessie to a river where the pony was tethered for the day until their return. They then rowed themselves across the river and walked the remaining appreciable distance to their school. At the end of the day, this journey was reversed. Bessie apparently had a tendency to stop dead in her tracks, precipitating my mother over her head. At Taumarunui School, my mother's skill at arithmetic was recognised and she was delegated to mark exam papers for both her class and the class above. George Thomas McCauley, my grandfather, was a larger than life character who worked as an axeman and sawmiller in the New Zealand bush. He was a well-known sportsman, representing King Country and Bay of Plenty at rugby and appearing at many chopping and sawing championships throughout the North Island for nearly thirty years. He had many successes over the years but perhaps his main achievement was in winning the two-foot world championship chop at the Axemen's Carnival at Eltham on 26/27 December 1911. George stood only 5 feet 9 inches tall and weighed only 14 stone but was regarded as “one of those solidly built fellows who are deceptive until one sees them stripped”. It was said “he was one of the strongest, if not the strongest of the bushmen who chopped in the shade of Mount Egmont”. He was also remembered by his contemporary bushmen for carrying a sack of potatoes some miles into camp over rough country, across the Patea river. To give some idea of the strength required to perform this feat it is only necessary to add that twelve sacks of potatoes weigh a ton. A newspaper article written just prior to the Katikati centenary celebrations claimed that “in his heyday, George McCauley was considered the best all-round athlete in New Zealand” Like his father, George Thomas McCauley died in tragic circumstances. He had set up a saw-mill in Inglewood and lived alone in a wooden hut (or whare) he had built. During the night of 19 October 1938, his hut caught fire and George was burnt to death; the exact circumstances are not clear but it seems most likely he fell asleep while smoking in bed. Following a trip to New Zealand in 2000, I made contact with a man called Trevor Orr who, as a 16 year old lad, lived with his parents over the road from George’s saw-mill, knew him quite well and gave evidence as one of the witnesses at the inquest into George’s death. I exchanged letters and e-mail messages with Trevor and was looking forward to meeting him during my next trip to New Zealand but, sadly, he died in May 2003. As the result of an Ancestry DNA test I had done in January 2019 a family scandal emerged that I knew nothing about (see Home page of this website). It seems that George Thomas McCauley had a relationship with his brother William’s wife, Edith Mary McCauley, in 1927, two years after the death of his wife, my grandmother Sarah Ann McCauley. This affair occurred while William was in Tokanui Psychiatric hospital between 18 July 1927 and 28 September 1927 when he died of syphilis. When William was admitted to the hospital by George he was described as being very confused, listless, silent, of haggard appearance and refusing to answer questions. Apparently, Edith relied on George to take her to see William in hospital and he was always with her when they had meetings with the doctors. He was said to have been a great help to her. The following year, George and Edith had a daughter, Dawn Margaret McCauley, born on 19 May 1928, the mother of Jim Hight. Although William is recorded as Dawn’s father on her birth certificate, the Tokanui medical records indicate she was illegitimate, with George as her father. She was therefore a half-sister and not a 1st cousin of my mother, formerly Hazel Emily McCauley. Edith McCauley was later admitted to Tokanui hospital, also with syphilis, on 27 January 1931 and died there on 26 November 1931. One of Dawn’s half-brothers, Allan, subsequently died of syphilis at the age of 13 on 11 September 1937. Sadly, Edith and William McCauley also lost four still-born babies during their marriage, as well as a son who died six days after his birth; their deaths too may have been syphilis - related. After Edith’s death, Dawn and her elder half-sister, Nita Mary, were brought up by numerous foster families because, it is said, none of the McCauleys wanted anything to do with them for fear of infection. It is unclear whether Dawn or Nita knew about Dawn’s parentage. Nita’s daughter, Mary Andrew, believes that neither knew and says that both of them always referred to William as their father. On the other hand, Dawn’s son, Jim Hight, said his mother always talked proudly of George, the world champion axeman, and, with hindsight, he thinks the reason for this was understandable because she did know but bore the “cruel secret” all her life without mentioning it to her children or anyone else. Following their mother’s death, my mother, Hazel Emily, her brother John Glen and young sisters, Olive Rae and Quita Margerett Eva, were ultimately brought up in New Plymouth by their uncle and aunt, Harry and Margaret Isabella Ladner (nee McCauley), who was John Jnr.’s fifth child. Margaret Isabella, like her mother Eliza Jane, was also a strong but kindly woman whom I well remember, having stayed with her on many occasions. As befits her upbringing in an “Orange” family, she was a devout Anglican, who walked the two miles to church every Sunday without fail, even at the age of 80. She and her husband, Harry Ladner, a carpenter and joiner who built his own house, aimed to be self-sufficient, keeping chickens that were partly fed with waste meat bones crushed in a home-made “bone-crusher”, and growing their own vegetables and fruit, from which they made delicious jams and other preserves. They even had a supply of their own soap, made from fat carefully stored during the grim days of the 1930s depression. They lived frugally, refusing to have a refrigerator, washing machine, car or telephone and cutting up old newspapers for use as toilet paper. Personal hygiene was not a high priority as they bathed only weekly! They walked everywhere, never using public transport, and Margaret knitted pullovers and socks for her relatives and stored away most gifts given to her, never to be used, like the carpet sweeper that was considered much too superior for domestic use. My mother once received a pair of stockings from her as a birthday present and was most amused to find a second card inside with the message “To dear Aunt, with love from Rae”!! Margaret and Harry Ladner could, however, be much more generous to others than to themselves; we grandchildren of George Thomas McCauley were regarded with particular favour, especially as we treated them like grandparents, and they were very generous to us with their monetary and other gifts. Hazel Emily always prided herself on her spelling and arithmetical ability and, on leaving school, joined the accountancy firm of Duff and Wynyard in New Plymouth. A keen member of the Taranaki Alpine Club, she climbed Mt. Egmont nine times. In around 1935, Hazel was appointed to the staff of the Reserve Bank in Wellington and is recorded in the 1935 electoral roll as living in what seems to have been a block of flats at 146 Abel Smith Street, Wellington North. Whilst in Wellington, she met a pharmacist at Boots the Chemists, my father Eric Robert Anderson, who was living in the same block of flats in 1935 and whom she married in New Plymouth on 22 January 1938. A letter sent to Hazel Emily by her father, George Thomas McCauley, on 25 November 1937 prior to her marriage is transcribed in Appendix 6 at the end of this document. This is interesting because it is the only known surviving letter written by my grandfather but is also rather sad. He was obviously upset at not being asked to give my mother away at her wedding; that was left to Harry Ladner (always referred to as "Unc", hence the reference to "Unc's Pal" at the end of the letter). The request for him to make a speech at the reception seems to have come as something of an afterthought. The letter is written in rather sarcastic terms and also seems to suggest that at that stage of his life George Thomas had something of a drink problem, as may be noted by his comment regarding "something to eat (no I did not say drink)". Possibly my mother and her brother, John Glen, had been challenging him about this. It could be that on the night he died he had been drinking prior to smoking in bed, causing a fatal fire. After their marriage, my mother and father are recorded in the 1938 electoral roll as living at 12 Karipo Street in Wellington. In May 1941, Hazel and her husband moved to Wanganui where Eric succeeded his father as Managing Director of the Wanganui Furniture Manufacturing Company Limited. Hazel was active there in the Mothers Union of All Saints Anglican Church and as secretary of the Wanganui East School parent/teacher association. She also enjoyed tennis and was an accomplished pianist, often improvising with what Eric called a “dirty left”, and a lover of romantic music, poetry and English literature. She even played the timpani in the Wanganui City Orchestra for a number of years. When Eric was struck down with rheumatoid arthritis in 1965, Hazel nurtured and cared for him until his death on 5 September 1967. In January 1969, Hazel had a happy second marriage to Keith Armstrong Atkinson (1907- 1988), whom she had first met many years previously, possibly on a cruise to Milford Sound. Hazel Emily took a great pride and interest in her Irish and, more specifically, McCauley background. As befits her Irish ancestry, she was extremely superstitious and paid regular visits to a local fortune-teller, Mrs. Fisk, who accurately predicted how her children would meet their future marriage partners. She was a diligent correspondent and prolific letter-writer all her life and kept in close touch with many of her McCauley and Ford relatives. An excerpt from a letter she wrote to me on 22 November 1967, soon after the death of Eric, about a recent trip she had made to the Waikato and Bay of Plenty, is transcribed in Appendix 8 of this document. Eight years later, in 1975, Hazel Emily again visited Katikati to attend the centenary celebrations. She died, aged 79, on 29 January 1990 in Auckland of cancer. My uncle and godfather, John Glen McCauley, left school at the age of about 15 and worked as a journalist at the Taranaki Daily News in New Plymouth for about seven years. He was a proficient player of the cornet and other wind instruments and I have a silver medal he was awarded in 1931 for his playing of the flugal horn at a competition in Hawera. John then spent about three years in Wellington managing the office of a well-known commercial advertising firm before travelling to London, England in 1937 where he worked in a furniture store and newspaper advertising. He married Joan Dorothy Harvey, another New Zealander, in London on 16 July 1938. John and his wife, accompanied by a friend from New Zealand, Trevor Bellringer, toured the continent, including Germany, in July- August 1939, immediately prior to the second world war. An interesting account by Joan of what they found there, entitled "Germany in August", was published on page 6 of the Taranaki Daily News on 13 September 1939. On the outbreak of war, John and Joan were living in a boarding house, with 5 other residents, at 30 Belsize Square in Hampstead, London; John was employed as an Advertising Manager and Joan as a Stenographer for Lever Brothers. John Glen subsequently joined the Royal Air Force but was unsuccessful in his efforts to become a pilot. However, on 18 March 1942 he was granted a commission for the emergency as an Acting Pilot Officer in the Administrative and Special Duties Branch of the Volunteer Reserve and was subsequently promoted to Pilot Officer and Flying Officer. "On its way from Portreath to Gibraltar, while overflying the Biscay Bay, aircraft went out of control and crashed into the sea off the Spanish coast. All eleven occupants were killed." The bodies of four of the eleven passengers and crew aboard John Glen McCauley’s plane were washed ashore in France, and buried there, but the body of John was one of those never found. An assessment by meteorological experts of the weather conditions, tides and the location of the four bodies recovered suggests that the plane crashed 60 to 90 minutes into its flight at a position of 49 degrees north and 8 degrees west. Three successive generations of McCauley men, John Jnr., George Thomas and now John Glen, had therefore died in tragic circumstances. John Glen McCauley's last letter to my mother, written on 5 December 1942, two weeks before he died, is transcribed in Appendix 7 of this document. Transcriptions of this and other letters he and Joan wrote to my mother before and during the second world war have been compiled by Debbie McCauley for inclusion in the following website: http://tauranga.kete.net.nz/katikati_history/topics/show/1020-mccauley-letters-to-new-zealand-from-wartime-britain. A number of these letters have also been published in a UK website, Memories of War, the link for which is: http://www.memoriesofwar.org.uk/page_id__315_path__0p1p3p.aspx. For a long time, my mother was reluctant to accept that her brother had died and, after the war, she contacted the Ministry of Defence in Wellington about what proved to be an erroneous report she had received that a Pilot Officer J. G. McCauley, a New Zealander, had been released from a prisoner of war camp in Poland. I have a silver medal, the New Zealand Memorial Cross, sanctioned by George VI in 1947 and awarded by the New Zealand government to commemorate the country’s servicemen killed in the second world war; the medal is inscribed on the back with John McCauley's name and service details and was either given directly to my mother (as John's eldest sister) or passed to her by John’s widow, Joan Dorothy, who had remarried in London in 1944. Her new husband was Struthers Robert Wallis, who served in the Merchant Navy and eventually became the Harbour Master in Auckland. Joan returned to New Zealand on the ship Rimutaka, leaving the UK on 10 July 1946 accompanied by her one-year-old son, Phillip Harvey Wallis, who had been born in London on 1 April 1945. Joan and her second husband subsequently had two further sons and a daughter. In a letter to my mother in 1948, the headmaster of the school she and John had attended in Katikati reported that Joan’s father had been redecorating the house in Katikati presumably inherited by Joan following John’s death and had said to him that, although she had remarried, she still had very deep feelings for her first husband. It is understood that Phillip Harvey Wallis became a chiropractor and his name is recorded in the 1978 and 1981 electoral rolls, living with his wife, Rosemary Estelle, at 24 Matipo Street in East Coast Bays. Phillip subsequently married Judith Ann Rendall and they had two sons. Struthers Robert Wallis died in 1978 and Joan Dorothy Wallis in 1996. John Glen McCauley's name is inscribed on panel 67 of the Air Forces Runnymede Memorial near London, commemorating airmen who lost their lives in world war two and have no known graves. My aunt Quita Margerett Eva McCauley married Trevor Crone and had nine children, including twin boys dying the day after their premature birth and another son dying at 11 months. Quita died in 1967, of cancer, at the early age of 44. Her elder sister, Olive Rae, my godmother, married Noel Wright and had three children, of whom the youngest, Patricia Wright, is a well-known New Zealand opera singer. Olive Rae died in 2000. Katikati has always been known as a settlement where the pleasures of matrimony are rightly understood, and to the fullest enjoyed. On Monday, 28th October, one of the happiest and most successful weddings that has ever taken place here came off with great éclat. The bridegroom was Mr. William Macgregor Simpson and the bride Miss Jane McCaw(u)ley, eldest daughter of Mr. John McCauley, jr. The ceremony, which was performed by the Rev. W. Katterns, was solemnised in the parlour of Fairview Cottage, the residence of the bride’s parents. The bride, who was given away by her father, was robed in a becoming dress of cream figured silk with lace and ribbon to match; ornaments—a gold brooch, the gift of the bridegroom, and a pearl necklace. Miss Rea acted as bridesmaid, and wore a most effective costume of cream sateen with ruby ribbons. Mr. A W. Fisher attended the bridegroom as best man. Instead of the usual exhortation at the end of the marriage service Mr. Katterns addressed a few stirring words of loving advice to the newly married couple. After the ceremony Mr. and Mrs. McCauley entertained a numerous party of friends to a most sumptuous repast, the tables literally groaning with good things, and the wines being nectar fit for the gods. The wedding cake, a noble specimen of confectionery, reflected great credit on Mr. Maxwell of Tauranga. The health of the happy pair was eloquently proposed by Mr. Katterns, and briefly responded to by the bridegroom. The health of the parents, Rev. W. Katterns, and the bridesmaid were duly proposed and received with musical honours. The presents, which were numerous and handsome, were tastefully exhibited in the parlour, amongst which we noticed---Mrs. McCauley, china tea service; Mrs. Stewart Rea, a large meat dish, (may she always have plenty on it); Mr. and Mrs. McClung, half a dozen very superior knives and forks; Mrs. Middlebrook, Dunmore china fruit dishes; Mrs. Mulgrew, sen., breakfast cruet; Mr. and Mrs. Jinkinson, butter cooler; Miss Rea, pretty slipper vases; Mr. George Hyde, cut glass sugar bowl and china cheese dish; Mr. A. W. Fisher, white fan with love birds painted on it; Rev. W. Katterns, bottle of choice wine and handsome bouquet of flowers. Fairview Cottage was appropriately decorated with ferns and flowers, speaking volumes for the taste of the bride, who personally superintended the decorations. Mr. and Mrs. Simpson left in a carriage and pair at 6.30 for their home at Greenton amidst a shower of rice and slippers. Those who had the privilege of being present on this auspicious occasion will ever remember with pleasure the true Colonial hospitality shown by Mr. and Mrs. McCauley, who, whilst they have lost a daughter, have gained a son who won the regard of those who saw him pass through the most joyful ordeal of his life. The bride’s travelling dress was of navy blue cashmere, with cardinal trimming of the same material. It is needless to state that the tragic death of John McCaula(e)y, resulting from the flood damages on the Waihi main road, has caused a feeling a feeling of depression and gloom in the settlement. He was at the Road Board opening ceremony on Friday night, and I came across him on Saturday morning at about 4.30 a.m., when he told me he would be starting for Waihi on his usual weekly visit. I had a warm grip of his honest hand, but little did I think that within a few hours he would be called away to his long home. The funeral took place on Wednesday and was one of the largest it has been my lot to witness at Katikati. I counted over 35 vehicles at one turn of the road. Rev. Katterns performed the funeral rites of the Church of England. Many wreaths were laid over the grave and among them one composed of white shells laced upon a wood formation, sent by Mr. and Mrs. Stern, of Martray, which amongst the floral wreaths was unique in appearance, but will remain as a long-standing memento of regard and esteem. Tragic accidents of this kind do not often occur at Katikati, but John’s brother William was killed a few years ago by a young horse bolting. He was thrown out of the dray, the wheel passing over his neck causing instantaneous death. I am informed that poor John McCauley was driving the same horse when he met with the accident. Rev. Turnbull and Mr. Charles Dunne proceeded on Sunday morning to break the news to his widow, who was frantic with grief. She did not expect his return as he had promised her to stop at Waihi with his son and daughter, who are both comfortably settled there. The deceased was a strictly sober man. On his return from Waihi he was following Mr. Hopkin (who was driving a wagonette and pair of horses), holding the lamp in one hand, the reins in the other, which is presumed to have been the cause of the sad accident. Though not a member of the No. 1 settlement he followed it to Katikati, accompanied by his wife, his father, step-mother, and a large family of brothers and sisters, hailing from Clogher, County Tyrone. He joined the No. 2 party, and though he did not secure a good section of land, yet by his performance, industry and frugality, aided in every way by an ideal farmer’s wife, he prospered at Katikati, having grassed all his land and erected an up-to-date residence and offices, and shortly before his death purchased a valuable property in the neighbourhood of the Hereuhikahia river, upon which he intended to erect a new homestead. He leaves a widow, five sons and four daughters, all of whom, with the exception of two unmarried girls residing at home, are well provided for in homes of their own. Bricks were very good business in early Christchurch, where there was a chronic shortage of building materials. The earliest Hillsborough brickworks was established by Elijah Gadd, who was working a quarry in Heathcote Valley in the 1850s (note that this is incorrect). It was he who built Christchurch’s first (wooden) town hall in 1857 (note that this too is incorrect) and supplied stone for the walls of the second town hall completed in 1864. At Hillsborough he had a large orchard and garden and was winning prizes for his garden produce in the late 1860s. Some of his pear, crabapple, quince, plum and walnut trees still survive on the hillside and must be close to a century old. The bricks which he was making until 1880 may still be found on properties round about. His works were acquired and greatly expanded by the Wigram brothers, whose Hillsborough brick business was acquired by Thomas Horsley in 1905 and named the Christchurch Brick Company. The Hillsborough shopping center on the corner of Port Hills Road and Curries Road (originally Gadds Road) occupies the site of a gaunt stone and brick building erected by Elijah Gadd in early times with the hope that he might obtain a licence for it and do good business slaking the thirsts of the nearby brick and quarry workers. He did not get his licence as the authorities thought workmen might get drunk and fall off the cliff faces, and the place served as a home until the early 1950s, when it was demolished. Gadd, Elijah had a quarry at the foot of the Hills in the Heathcote Valley, June ’63. He was prepared to supply materials, stone, foundations, etc. at 30/- a yard. At a meeting of the County Freehold Land Society he recommended the Soc to wait until they had accumulated enough money to buy 800 ac. which was a good area in which to start a township. Wm Wilson had just recommended 400 ac. He stood for the Heathcote Rd. Bd. in Jan ’67 but failed to get in; and he failed again to get in Jan ’71. He won prizes for vegetables at the Horticulture Show of Dec. ’68 and again next year. He was elected to the Hillsborough Sch. Comm. Oct. ’73. He was one of the tenderers for the Ashley-Amberley railway contract, E.G. Wright got the contract; he was very hard to beat in this sort of work. Gadd built the first Ch. Ch. Town Hall-of wood- in 1857. (note that this appears incorrect) The Supreme Court used to sit there. E. G. Wakefield’s portrait hung there for years before it was moved to the Museum. Gadd had a large garden near Neighbour’s brickyards at Heathcote. It was a very dry summer and a fire started at the kiln and got into his garden. He said in evidence that he lost over 2000 trees. Dau. Emily Ann marr. 20.8.73 at Opawa Henry James Ford of Hillsborough. L.T. (Lyttleton Times) 17.6.63: 26.1.64: 30.5.66: 3.1.67: 17.12 68: 7.1.71: 14.10.73: 28.12.72: 23.8.73: ChCh C.C. Bur. Rec. I have been so interested in the book “The New Henry Ford” and am now presumptuous enough to write to you, because the likeness the book contains of yourself is so strikingly like my late father who was born on Oct. 1st 1851 and died eleven years (?) ago. My maiden name is Ford and the fact that my father bore the same first name as yourself set me thinking, especially so as I can recall father telling me that several of his brothers migrated to America. I also notice you are called after an uncle and I wonder if that uncle was my father. He came to New Zealand at the age of 17 years in the ship “London” (?) and afterwards lost all trace of his people, the last address being King Street, Longacre, London, and some time before his death a letter was received from a firm of solicitors in England stating that father’s family had left those parts for some years. I have wondered if you were related to my father as the similarity of characteristics struck me when reading of you at various times and other members of our family have commented when writing on the strong resemblance of yourself to our father. It would be a great pleasure for us to find father’s people and strange too as we have only recently discovered our mother’s folk in Bristol, England, where they have resided for generations. Mother was an infant when her own mother died on the voyage out to New Zealand and her father remarrying. She learned very little of her people with whom we now correspond and whom my brothers visited during the great war. We have photographs of father’s parents and sister and he told us he had eight brothers. Appendix 6: Letters 1 and 2 sent by Hazel Emily McCauley to Margaret Isabella Ladner (nee McCauley) and Harry Ladner after the death of her Mother, Sarah Ann McCauley, on 20 August 1925. Letter 3 sent to Hazel Emily McCauley by her Father, George Thomas McCauley, on 25 November 1937, prior to her Marriage. I just received your ever loving letter this afternoon. It was quite a relief to get it. It is sweet of you to offer to have us. John has written too but it was mother’s wish that we should remain home together for the present. We have a friend with us till Christmas time and we shall be glad to go to you some time. Of course we would like to go to you but we are all Dad has now and we must stay to comfort and look after him for the present. I am going to get school work from Waihi and do it at home because Madge is coming back and we will have two teachers who will help us here. I don’t think I would work in Waihi as I would be always wondering how they were getting on at home and I think if I was home I could do my work well. Mum died at six o’clock last Thursday and Auntie Eva will explain what was the matter with her. She was buried at eleven o’clock last Saturday in Tauranga as she didn’t want to be buried in Kati Kati. It was an awful shock to us all of course as we did not expect such a happening and she passed away quite peacefully. She never looked as beautiful as she did last Wednesday night when I saw her for the last time. I thought there was something going to happen from the Monday but none of the others seemed to realize. It is such a blessing that baby and Rae are too young to realize isn’t it? Of course it is very sad to have to part with mother when I was just getting old enough to have her as a companion but I am doing my best to be brave for the sake of my two young darlings. You needn’t be afraid of me turning out wicked dear auntie as my mother’s long teachings will stick fast to my memory. I will do my very best for Daddy and the three children and will bring them up well as mother would have liked them brought up. Poor wee Rae tells them all that she is going to meet mother in heaven some day and they are all bearing up well. Bubbie is splendid- has never mentioned mother’s name and all our friends are so good to us. How suddenly things do happen don’t they. I didn’t dream of losing my mother to whom I shared all my interests. I suppose it was God’s will and I will just have to bear it won’t I dear Auntie. Thankyou for offering us anything we need but I don’t really think we need anything just at present. Auntie, Auntie Lizzie and Eva ask to be remembered to you. Well dear Auntie, I must now come to a close and I trust that you understand about mother’s wish and especially hoping that you believe me to (be) still your own true niece and don’t think that I will wander away from being truthful, honest and loving to all. Dad is taking us away to you for some of Christmas holidays I think. Au revoir for present. I received your most welcome and loving letter on Monday and I was so delighted to hear from you. We are getting more settled now and Dad has started work. Madge is back and the kiddies are all at school so it is quite lonely without them. I miss mother very much during the day when there is nothing to do but I’ll really have to bear it all I know. I wouldn’t mind if I could grow up like dear mother but it can be done by trying only. One thing as you say mother will be in a land far away where there is no pain or worries and wouldn’t she be delighted to meet her mother’s and all her friends. Although she is far away, as I am working about in the day-time I can always feel her near to me and I am sure she watches us all the time so that is a comfort. Your letter duly to hand and Maud and I were delighted to hear of the "happy event" and per medium of this we convey our congratulations. After having submitted your letter to several interpreters, and then viewing their several interpretations of the subject matter, I have discovered that you wish me to take a part in the after ceremony which I hope will include something to eat (no I did not say drink), although I am not one (of) those camels that frequent the desert, and as I feel confident that calculations based on the theory that "one must eat as well as getting married" must be correct, I have the greatest of pleasure in acceding to your thoughtful request, nothing would give me greater pleasure than to have the privilege of doing this awful thing for you (that is how I feel about speeches). However Hazel, I will be there but please do not expect any fluent oratory. With kindest regards from Maud and I and all my sympathies are with the victim. Appendix 7: John Glen McCauley's last letter to Hazel Emily McCauley. Written on 5 December 1942, 2 weeks before he was lost over the Bay of Biscay. Too late for Xmas now--- I’m sorry but I’m a duffer of a correspondent. The Fella showed me your long letter to her which we were both pleased to get and to know that the brat is progressing well. Had a letter from Bill recently in which he gave me a rebuff about not writing you more often and I don’t quite know why I don’t—often I’ve got time--- just sheer laziness I fear. I’ve got a cracked rib at the moment from playing footy for the station a couple of weeks ago. I’m bloody mad because we’ve got some big matches coming off and I’ll be out for another month anyway. At the time I was with the squadron and having a wow of a time although duff weather curtailed the flying too much for my liking. It was just as well I was sent elsewhere because I would have wasted a month really with very little flying and much pain as I scramble in and out of aircraft with this rib. Which reminds me for some reason or another you seemed excited because I was a Flying Officer. Let me correct you by saying I’m a Pilot Officer and a P/O is the lowest form of animal life in the Royal Air Force and when I reach the exalted rank of a F/O I’ll let you know. At present I’m back at one of the stations to which I’ve been several times before and don’t know for how long--- I was told 9 days and that made me fairly sure it would be some weeks. It’s when one is told that’s it for good or some months that one usually expects to be moved the day after arrival. Anyway I’ve been 2 ½ weeks this time and fully expect to be here for Xmas which will be a good thing. It’s accessible, if only just, from London and as the Fella has 3 days off she may think it worth the effort to see her old man. I’m in a little country pub and the only fink billeted in this one which suits me fine. The only trouble is too much food and fuss making—otherwise it’s perfect with a private sitting and living room and colossal fires and beer laid on. I sleep on duty every second night and with a hellava damp and cold bedroom it was miserable in spite of a WAAF putting a blasted hot water bottle in the bed. I thought of an electric heater—had it laid on and have had it running under the bed for 2 weeks. The room is dry, the bed warm and although it feels as though someone is in the bed, to my regret there isn’t, but McC sleeps well. I hope to hell Bill gets my letter written the other day--- some must have gone west and similarly his to me including a photo. It seems they’ve made a bit of a mess of his affairs--- just poor old Muv’s implicit trust in these useless parasites. Maybe I’ll be back in time to have a go at someone for him. I figure it shouldn’t be more than 2 years now. It’ll still be a struggle but I don’t anticipate any major setbacks. We’ll crack those slippery Waps I think when we start bombing—they ain’t seen nothin yet. They’ll be bloody sorry old Musso ever personally asked permission of Hitler to be allowed to bomb London. Anyway all the squabbling will be in S. E. Europe. I thought I’d be bunged overseas long ago, still maybe yet. I wouldn’t mind 12 months but I’ll get a bit cheesed after that. Had a long letter from Mrs. Bellringer all about Trev in answer to one I wrote her and she’s asked for an answer-- I wish she’d let the matter drop. It’s very decent of you Haze to take on the K.K. business for me. You didn’t say how you wished it done and damn me neither did Merv when he wrote, but I hope he gave you sufficient dough to have a good margin—if not let me know and I’ll send some. Before I forget will you see about increasing the insurance cover--- with inflated prices that which was standing is inadequate. Merv can’t give you a power of attorney I believe and it’s not worth another being drawn up anyway—they’re too damned expensive--- so if you can manage conveniently without it I’d rather. I’m wondering whether you’ve managed to get any further with the transfer or is Quit still sticking a bit about it. If she is, well it’ll have to be left till I get home, but sometimes when I’m stuck up in a kite in a foggy night and it’s a question as to how hard we’ll hit the deck and whether I’ll know whether we hit it at all that the thought runs through my mind. Still don’t get too worried about pushing the matter. Anyway let me know just how you’re working with Merv will you Haze. By the way I think I forgot to mention before about my being a godfather---what’s it mean exactly and what do I have to do--- get him a silver beer tankard, isn’t that the idea. I figure I’ll know all about these things in time. Bye for now, love to you all now--- oh Hell that seems terrible--- from us both. I felt the trip was well worthwhile. Auntie Nellie (Eleanor Mary Martinsen, nee McCauley) and Uncle Jack (Jakob Raymond Martinsen) gave me a welcome indeed—one of the highlights for them and I guess, for me, was when I took them to Katikati—100 mile journey that day, through the Waikino Gorge and the Waihi Gorge. Auntie Nellie with the true Irish sentimental streak and love for funerals and tragedy showed me the exact spot (and I repeat this as she declared “Hazel, this is the exact spot”) where her father (my grandfather) had driven his horse driven buggy over the bank into the gorge and been drowned. There was a freak flood and the ground had given way. Our day in Katikati was a rare one—we drove around old stamping grounds—actually, it is a dear little place now. We had to go to the home of their birth so we set off. The folk who live on the 120 acres farm originally owned by the McCauleys, and who have built a pallatial home higher up from the old homestead, were delighted—he was a charming middle-aged gentleman—dignified, as was his wife. They seemed well educated and had children working on Ph.Ds—their hospitality was a joy, and they were obviously quite intrigued with the old dears and interested in every detail of early Katikati. Auntie, still with an Irish brogue and Uncle Jack with his Scandinavian background and a memory and knowledge which is hard to match had much information to offer. After afternoon tea, they drove us in their car through the fields down to the old homestead—Auntie Nellie was beside herself with emotion and reminiscing, as she stood there enveloped in cobwebs, trying to clarify the position of each room in which they had lived, getting excited when she showed us the room where they had their wedding breakfast (apparently, I was there too, at the age of two—I had been taken to the wedding). I couldn’t help but admire the sheer pluck of folks who brought up families under such primitive conditions. There is no doubt that the present day generation has been handled with kid gloves. We admired the pear tree which had been climbed and plucked by all the McCauleys, still standing there in its grotesque surroundings—the broken down old verandah where I guess they played as kids—the odd trees and flowers which have flourished there for eighty years or more—gave me a strange feeling—Oliver Goldsmith’s “Deserted Village” came to mind, it was certainly comparable. I eventually got them away from the old homestead filled with an adventure about which they had long dreamed and which they thought would not come to pass. Apart from revelling in every moment myself, I felt that perhaps at least I had contributed one day’s happiness to someone. We arrived back at 7 pm and believe it or not we were in Audrey’s car at 7.40 pm on our way to Hamilton to see Ray. Such was the tenacity of the Irish—age brought no barriers.